I seem to talk a lot about my childhood food experiences in this blog. I suppose that’s because so much of what we are and what we eat stems from those formative years and the experiences we had there. For years after I left home I held a sad abhorrence for a simple peanut butter sandwich, simply because I was given one to eat at school almost very nearly every single day. Only recently I rediscovered the pleasure of fresh, soft bread, spread thick with butter, peanut butter and oozing honey. And, true to my nature, I ate them so frequently upon this discovery, that my denims soon began to miraculously shrink in the wash until one day, getting dressed, I asked my Mr P, while staring down at my posterior, ‘do you think I’m putting on weight?’ And in true Mr P candid style, he promptly looked up from his book, ran his eyes up and down me and replied, ‘ yes.’ After which he carried on reading as if nothing more important than whether he wanted muesli or oats for breakfast had been discussed. Which, of course, is why I am so enamoured with this man in the first place. 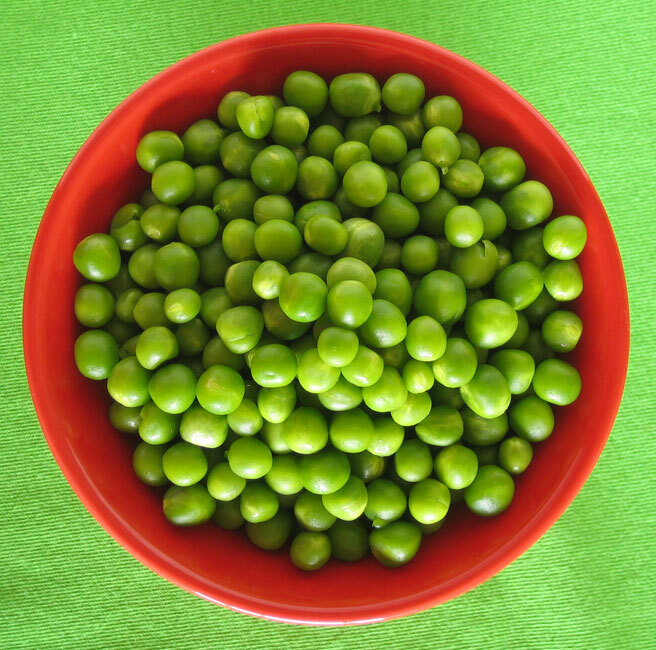 I remember that peas were a staple in our family. There were always a couple of bags of the frozen variety on hand and they would be chucked unceremoniously into so many one pot meals my mother would cook up. My mom was cook of convenience, speed and nutrition, seeing as how she was juggling family, work and cleaning the dishes after it all. So, somewhere along the line I began thinking of peas with disdain and stopped buying, cooking or even thinking about these simple green globes. And then, a couple of days ago, I walked past a bag of fresh, shelled, organic peas. Tiny, bright green and somehow translucent looking, they caught my eye and for reasons I really can’t explain, I bought them. And there they were. On the counter. What on earth was I going to do with them? I popped one in my mouth. Then another. And suddenly, I was five years old, helping my dear granny in her pride and joy: her veggie patch. I loved my granny’s veggie patch. There was a big bush of mint that grew under the tap, and patches of pumpkins, marrows and tomatoes. I loved the carrots, their soft green tops and the juicy, sweet roots. But what I loved the most were the peas. We used to get into trouble for picking them all and eating them before Gran could pick them for the kitchen. So sweet! So crunchy! My love affair with peas, I fear, has only just begun. I never new much about eggplants growing up. The reason, I found out when my parents visited us here in Toronto a while ago and I was doing all the cooking, is that my Dad abhors this beautiful, delicately flavoured fruit and so we never had it in the house. Oh, the disappointment of not being able to make my Iranian Eggplant and lentil stew, flavoured with pomegranate and fresh mint for them during their time here. 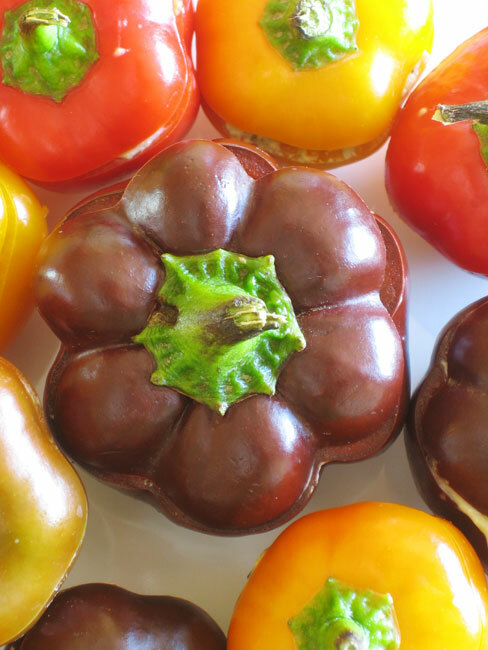 It was the colour of the skin which first attracted me to the eggplant a few years ago. That rich, almost black shade of purple, so mysterious and reminiscent of stories of Arabian Nights and Vincent’s Starry Sky. I tried a bunch of things with the Aubergine, fumbling around for a while not knowing what to do with it. Do you eat it raw? Do you put it in a stir fry? Until I got to know it a bit better, did a bit of reading and discovered a few ways of turning it’s slightly rubbery, raw flesh into the creamy, flavoursome meal it can be. I still hold hope that one day, perhaps, I’ll be able to twist me ol’ Dad’s arm and make him change his mind about this yummy food. 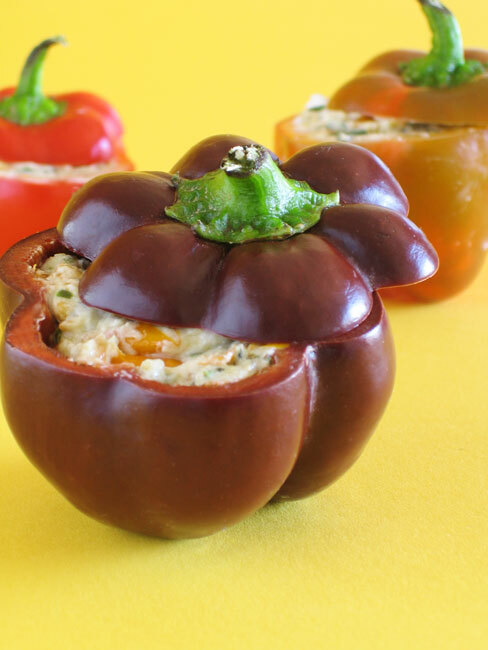 – place slices of eggplant on paper towel and salt. Leave for half an hour to sweat. Dry with paper towel. 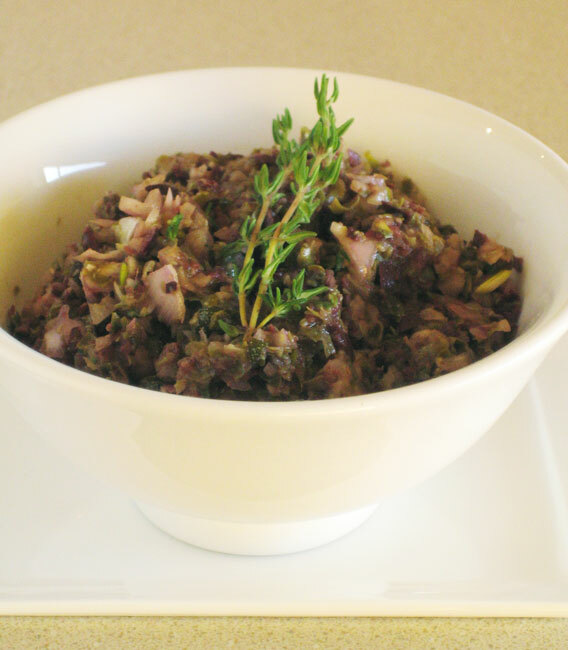 – place olives, capers, anchovy, shallot, garlic and thyme in a processor and blitz until finely chopped but not paste. Or chop all ingredients finely by hand and mix. 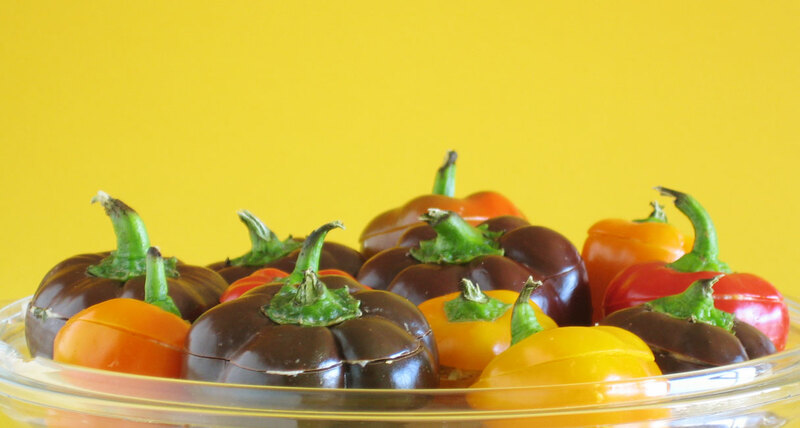 Refrigerate for half and hour to allow flavour to develop. 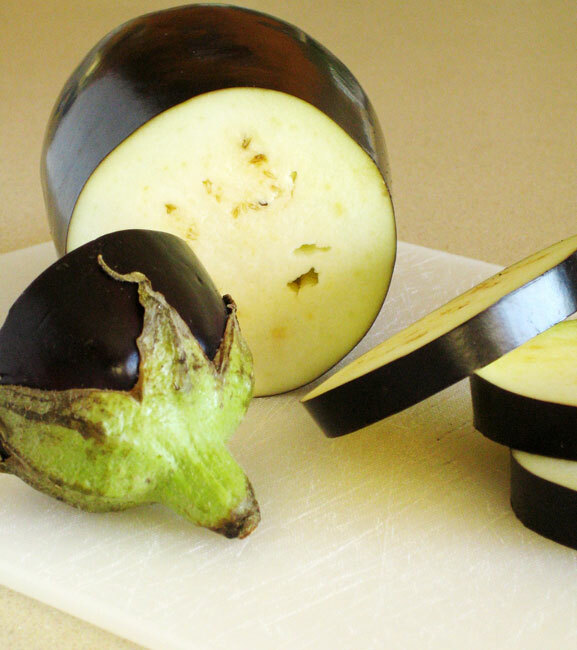 – fry eggplant in olive oil in batches until lightly browned and tender. Add more oil as needed and drain on paper towel. – place a serving of polenta on plate. 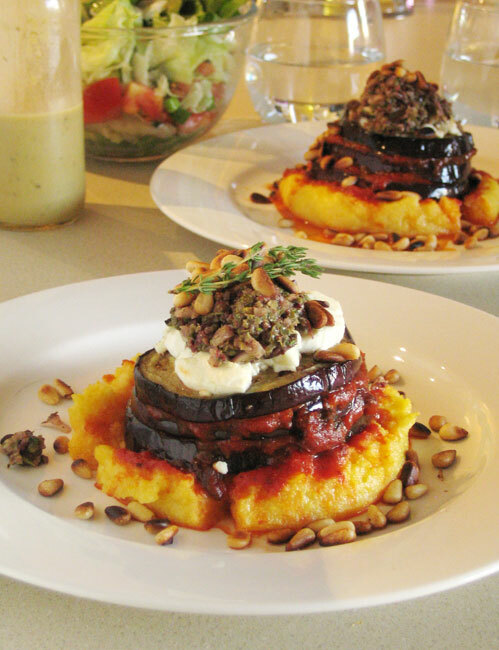 Add a slice of eggplant, top with tomato sauce and repeatto use 3 or 4 slices of eggplant. 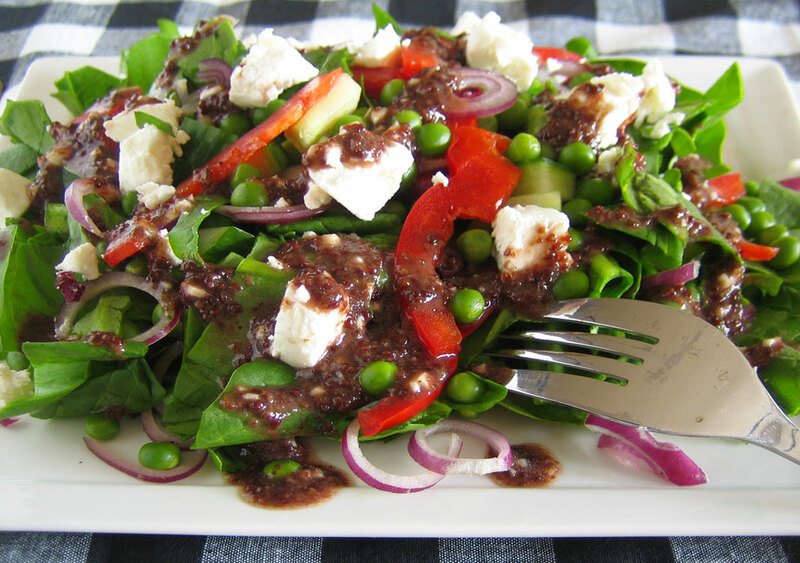 – top with about 1½ Tbsp goats cheese. Grill for 6 or 7 minutes under a hot grill, until cheese starts to bubble slightly.